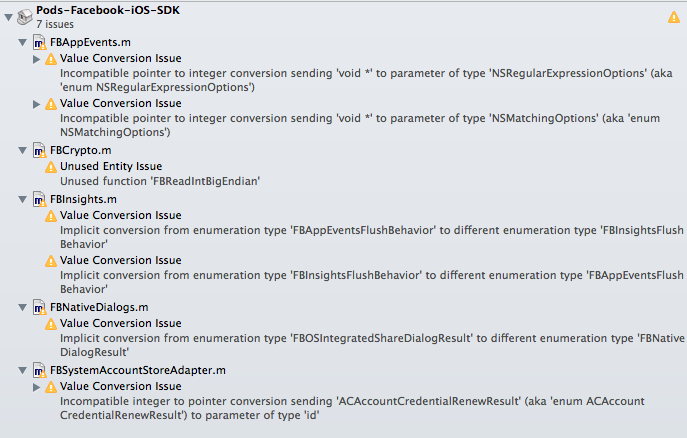 I have updated my Podspec to include the latest Facebook SDK 3.9 (of writing) and I am now seeing a bunch of warnings. A few of these should be simple solutions like updating nil to be 0 instead as expected. What is the best practice, just to leave these for a minor fix release which should resolve them? Changing the files locally would not be very helpful, because someday the files will be overwritten. (Podfile copied from this answer). I filed a bug - https://developers.facebook.com/bugs/724535024243347 - to which the Facebook guys replied that it's in my code and it's not their fault. After which I've submitted a pull request that fixes/suppresses the warnings in their code - https://github.com/facebook/facebook-ios-sdk/pull/563 Hopefully they'll integrate that one. Not the answer you're looking for? Browse other questions tagged ios facebook ios6 cocoapods facebook-sdk-3.0 or ask your own question. If I'm sorting objects using compare, how do I tell it to not sort if one of the objects is nil?